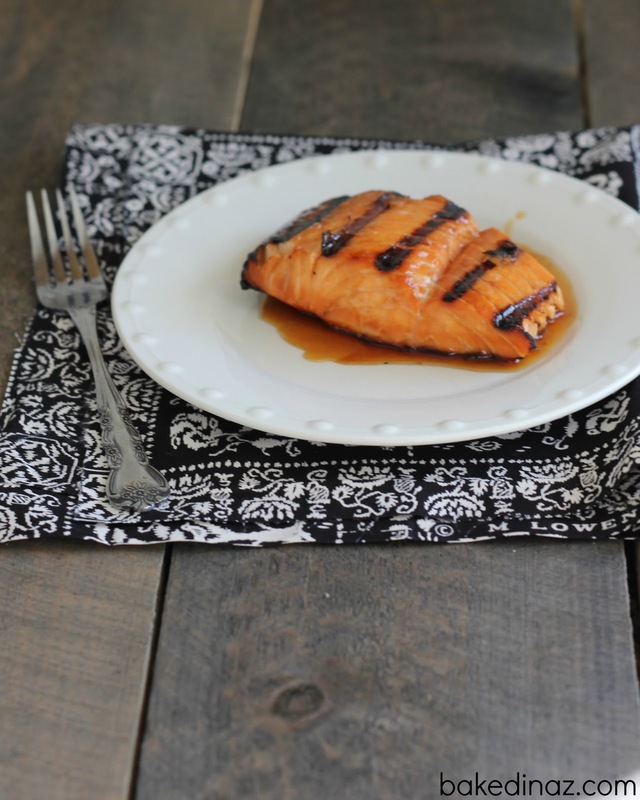 This grilled salmon is easy to make and tastes amazing! I was looking for a new way to grill salmon a while back and came across this recipe via a google search. 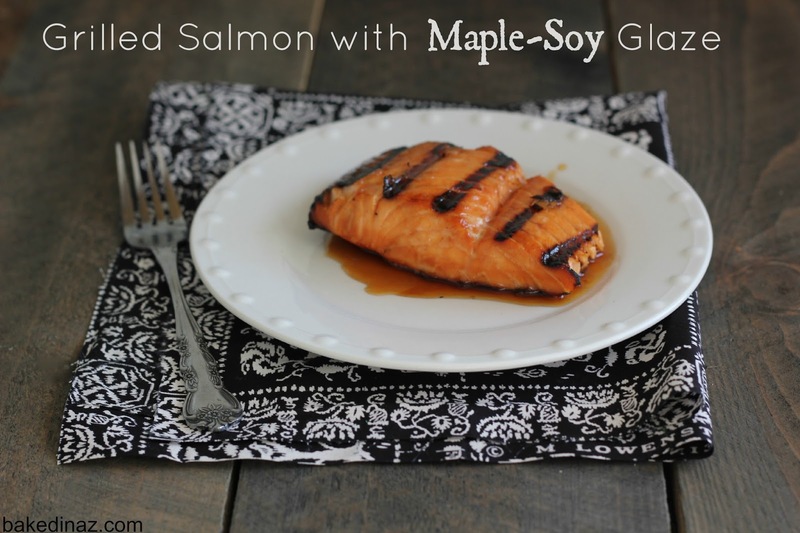 It is now our go-to way to marinate and grill salmon. I love it because you only need to let it marinate for 15 min! With only 2 ingredients for the marinade, it’s simple but full of flavor. The maple syrup gives it a sweet, crispy crust. We like to eat this broken up in pieces over salad or served with rice and a veggie. I know it may not be grilling season for some, but here in Arizona, it’s finally the perfect weather to cook & eat outside! Place the salmon in a dish. Measure the soy sauce and maple syrup. Stir together then pour over the fish. Place in the fridge and let marinate for 15 minutes. MAKE THE GLAZE: Pour the soy sauce and maple syrup into a small saucepan. Bring to a simmer for a couple minutes to thicken up into a glaze. Set aside 2 T. of the glaze. Grease the grill so the salmon doesn't stick by wiping down the grill grates with a paper towel soaked in vegetable oil (use tongs). Place the salmon on the grill. Cook for about 3-3½ minutes. Brush some glaze over the top. Carefully, flip the salmon over, brush with more of the glaze and cook for an additional 3-3½ minutes. Salmon should have a nice crust but not flake to easily. If it flakes easily, it is a bit overcooked. Remove from the grill & drizzle the reaming 2 T. over the top of the salmon and serve. My husband sprays the grill with cooking spray. It makes it flame up a bit so use caution if you want to grease the grill that way. Make sure you use pure maple syrup, not the cheap pancake kind. Also, we purchase our salmon fillets in the frozen section of Costco and are very happy with it. They don't have skin and are packaged individually. I believe they are in a blue bag.